Hi bloggers. Todays post How To Make Post Title Appear Before Blog Name . Brand new and banging methods Do you write a new post every day? And want to always appear first in Google ?.Tired of doing so much But never before is your post showing up. So what will you do now?. Today I'm going to teach you the whole way. 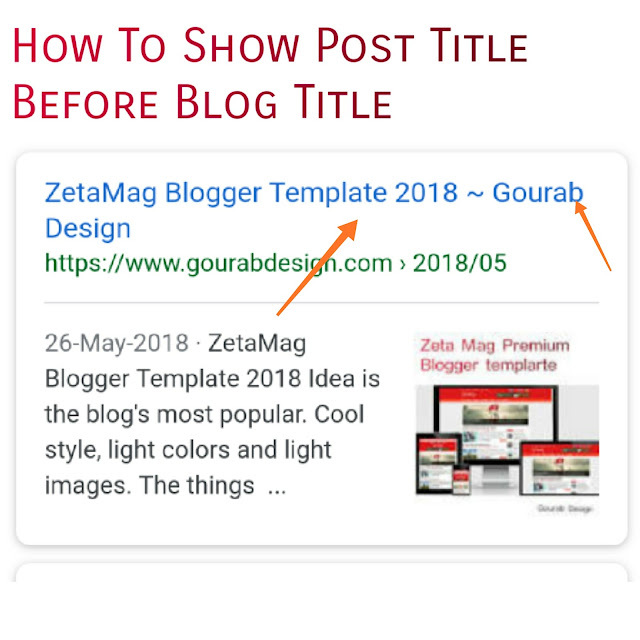 Which will show the title of your post before the title of your blog. Which is why your website will rank. Once you have done it, you will see it again after that. Your traffic will increase. Will appear on the first page. And if your luck is good then all your website will be like. But let me tell one more thing. Write whatever you write well. Different from all. And the best. Write a post of at least 500 words. Not less than ok.
Find all my articles in any search engine. Seeing my article is looking first. After that, my blog's title If you want to do so too Now teach it. So that everyone can get some help. Very easy process tips blogspot. Nobody will have any problem in doing this. And with Guarantees it is also SAO friendly. Then click on TEMPLATE option. 👉Now see EDIT HTML option. Simply touch it. Wait 24 hours. Then searching your post title for any engine. See magic. Your article name is first show before website name. I hope .is it very useful for you. But that you don’t changes other things in the template as it may run your wbsite. If you have any question about this artcle, then feel free to inform me on comment section. If you like this update then don't forget share this with your others friends. Thank you.